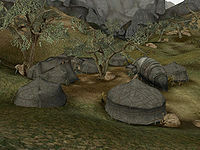 The Zainab Camp was located on the western edge of the Grazelands region, southwest of Vos and south of the Dwemer ruins of Nchuleft. From here, the Zainab controlled the southern Grazelands. This page was last modified on 11 September 2018, at 19:12.